Probability: Smart Cars, Architects, and The “Color” Black | Break It And Learn! Waiting for the bus in Roma, Italia, May 2007. Smart Cars stopped at a stoplight. What’s the probability of photographing 3 Smart Cars in a single (non-panoramic, fairly close) shot without being at a Smart Car dealership? In Europe that probability is as high as the probability of five architecture students independently walking into a room with each wearing a black shirt! Which is VERY high! That’s what happened last summer when I studied in the Netherlands with fellow architecture and landscape architecture students. A few of us were in the common kitchen area of our flat, and somebody pointed out that two people in the room were both wearing a black top and jeans… I looked down, and I was wearing the same thing! And looking around the room, another black shirt-jeans combo! Another person entered the room… Black top, jeans! Hypothetically, if 5 students each had two shirts in his/her closet, a black one and a non-black one and blindly grabs one to wear, the chance that all five would wear black is (1/2)^5 or 1/32 or 3.125 %. Of course that’s a hypothetical situation. So… That strange occurence of virtually everyone in the room wearing the same black top-jeans combo is actually statistically very likely! 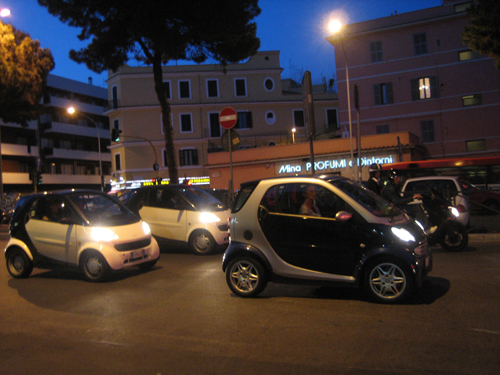 As is the likelihood of seeing 3 Smart Cars on the road next to each other in Rome!